I enjoy food blogs a great deal. Partly because I love cooking and recipes, and partly because I find them (us) to be endlessly amusing. So many elegant little nibbles, such perfect photography, such stylized food. There is a reason I take such close-up photos, people: it’s so you can’t see the rest of my kitchen. Which is usually a total disaster. So, just so you know, when I see your photos on your blog, I imagine that the rest of your kitchen looks just like mine. Maybe it does and maybe it doesn’t, but imagining that you also have dishes piled all over the OTHER counter amuses me every time. It’s partly because of the perpetual chaos in my house (need I remind you that my girls are 1, 3 and 5?) that I enjoy creating a separate, peaceful plane in my life by writing this blog. Taking photos with the mess cropped out. And eating a little better than I might if I weren’t thinking of sharing my recipes with all of you. So thank you! Take these mushrooms, for instance. It’s plenty tasty to toss mushrooms in a pan, sear them brown, and season them well with salt and pepper. But it’s just one smidge more delicious, and hardly more effort, to splash a bit of white wine into the pan and finish them with a pinch of thyme leaves. And suddenly, thanks to your presence in the kitchen with me, I’m making a dish fit for company. A spoonful of these mushrooms will dress up any dish (try heaping the chopped mushrooms onto an egg and toast for breakfast, or spooning them into a panini with some melty cheese, or piling them onto a pizza). Sauteed sliced mushrooms alone also make an elegant side dish on a dinner (or breakfast!) plate. Remember that mushrooms are mostly water and will cook down quite a bit. I’d allow a pound to serve four people. 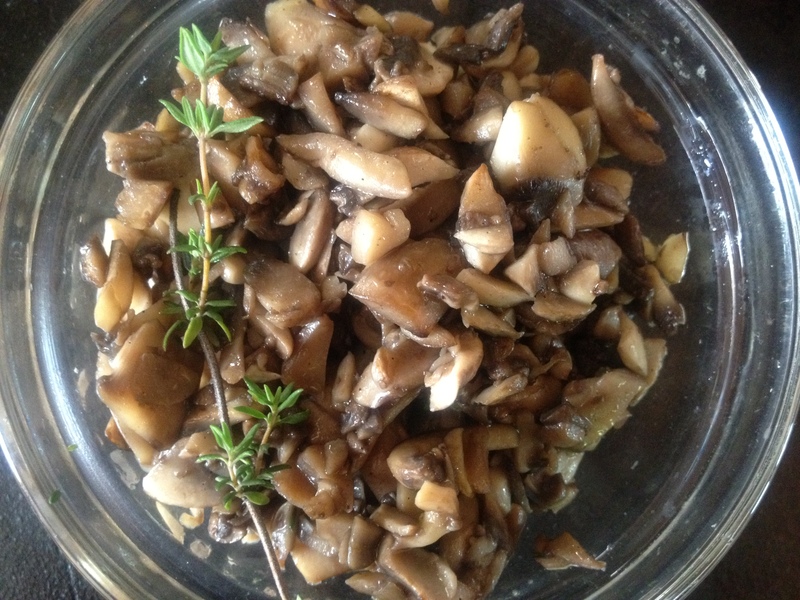 Sauteed Mushrooms with White Wine and Thyme: Saute chopped or sliced mushrooms in a little olive oil over medium-high heat until golden. Add a splash of white wine and simmer until it has nearly evaporated. Season with salt and pepper and the leaves from a branch or two of thyme. Yes, of COURSE you could stir in a little minced garlic with the thyme and stir for a minute before removing the pan from the heat. Of course. This entry was posted in Food, Recipes, Vegan or Would-Be-Just-As-Good-Vegan, Vegetables By Themselves and tagged breakfast, cooking, dinner, family, food, lifestyle, mushrooms, recipes, vegan, vegetarian on May 25, 2012 by emmycooks. While I was looking for a new food blog I first was attracted by your photo of fungus (which I love to distraction) but also the line about the rest of your kitchen being a mess. I instantly related because even though I don’t do food for my jewelry blog I crop just as much, for the same reasons. My jewelry stuio isn’t any neater than your kitchen. Ah kindred spirits! So as I perused your blog I was happy to find some really cool recipes that I will certainly try. I’m glad to know I’m not alone. :) I suspected as much! I’m happy to hear you found some recipes that look good to you. I am going to try this with gnocchi. I think it would be a match made in heaven. Shall let you know how I go. Thanks for so many wondrous ideas. And for the record, my kitchen is exactly like yours – dishes piled high and close ups of the good stuff that avoid the messy truth. Mushrooms, white wine and thyme! One of my favorite things! I use butter though. Frenchy French! Ha! My kitchen is the same way. I have about one surface that is actually presentable and I think my readers might start getting suspicious about the same background in pic after pic! You are so right about the kitchen. Including my kitchen table that the cats are sleeping on until we push them away so we can eat dinner. I love the photos because it’s what I wish it really was! Your mushrooms are lovely … whatever the rest of the kitchen looks like. I love that you have cats sleeping on the table. And why not? That’s where the good stuff happens. :) And I agree, I like the photos, they’re a little oasis of calm. My kitchen is always a huge mess while I’m cooking, luckily my husband cleans up after me so afterwards it’s squeaky clean again. Just like you, I have to clear away some space to take photos for my blog without any mess. Sometimes I’m surprised at the wide angle of the lense and have to take a step back and zoom in (to get a smaller angle) or clear away more stuff. Sometimes I misjudged and you can still see something in a corner that wasn’t supposed to be there. Sometimes it’s also a challenge to take pictures of every step without getting the camera all dirty from my hands or without overcooking something when I need to work fast. Thanks for the idea. I usually stick to classic Italian mushrooms (trifolati = sauteed with garlic and parsley), but white wine and thyme sounds like a nice variation to try. Haha, I am in total empathy with you and your messy kitchen, I live with four other students who have to share a kitchen the size of a garden shed so you can imagine what that’s like! I have to photograph my food in the living room, or even my bedroom to get space and some natural light! Is that one kind of mushroom in there, or a variety? I used crimini mushrooms, but plain white button mushrooms or chantrelles or any combination of other mushrooms would work as well. Enjoy! This sounds simply fantastic. Already planning a dinner of these mushrooms on top of some quinoa, maybe with a chicken breast and some lightly sauteed green beans. Ah, yummy!